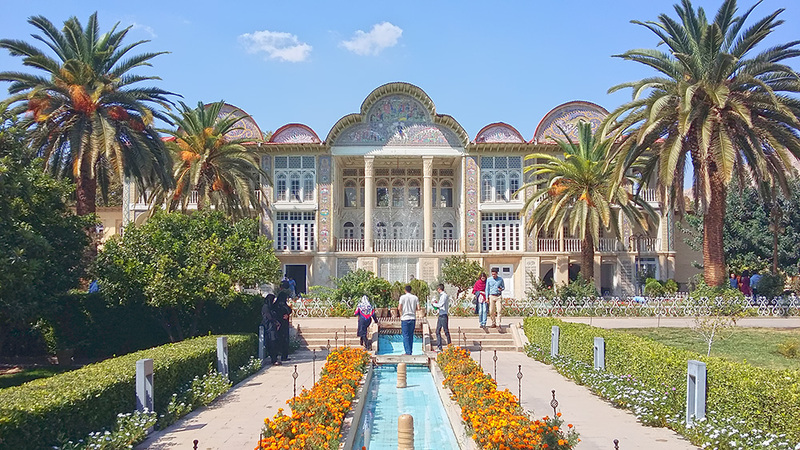 Iran is one of those few countries which still feels like an untouched gem. Few visitors think about exploring it by motorcycle, whereas it provides a truly unique experience with more intimate and special connation with local people. And in Iran, you won't be able to put one foot on the ground without meeting someone eager to exchange with you around a cup of tea! Put on your helmet and embark on a 1500 kilometers ride through the immemorial Persia: From Shiraz, the city of poets and delicate gardens, to the immensity of harsh deserts, via the blue jewel of Isfahan and the sandy wind catchers of Yazd, discover the pure and enchanting face of Iran with a escorted English speaking guide and mechanic though all your journey. Traveling by motorcycle is one of the best ways to fully enjoy a country's landscapes while experiencing an exceptional sense of freedom. Because Iran has plenty of breathtaking rides and scenic roads to offer, this tour gives you the opportunity to combine the pleasure of the road with the discovery of its most famous cities, covering the most touristic path. It's in Shiraz, one of Persia's former capitals that your adventure begins. Immerse yourself into its delightful mood and sour orange smell in the weather, visit its awe-inspiring mosques and impressive shrines, or relax with a Persian tea in one of its captivating bazaars. The next day, it’s time to get on your bike and our first ride takes us to the divine Eram Garden and Bamou national park. Leaving Shiraz behind, we embark on a journey in the footsteps of the Achaemenid Empire, riding to the World Heritage Sites of Persepolis and Pasagardae. It’s here, in these loads of culture next to Cyrus the Great's final resting place that we spend the night. On the following day, we leave the Fars province, heading toward Yazd. However, in the way we stop in where you visit the exceptional character all over the country, the only living being in the world has seen Marco Polo. "Abarkuh Cypress", known as Sarv-e Abarkuh, has almost 4500 years-old. It's a belief that Zoroaster had planted this tree. It's time to dive into the sand dunes and infinite landscapes of the desert. One of those dusty roads is leading to the ghost town of Dehshir, before climbing up the Shir Kuh Mountain and offering a ride surrounded by bizarre rocks formations. As the night approaches, the sight of the windcatchers of Yazd appears at the horizon, announcing your final destination for the day. Yazd, master in architecture; the modest world heritage city with its patient residents that never neglect to bring novelty to their arid land in the middle of desert. You are to wander into its narrow ochre streets, the mouthwatering taste of Qottab, Lozi, Pashmak delights, don't miss out to step under the picturesque arc of blue Jameh Mosque and get lost in time under the symmetrical alcoves of Amir Chakhmaq Complex. 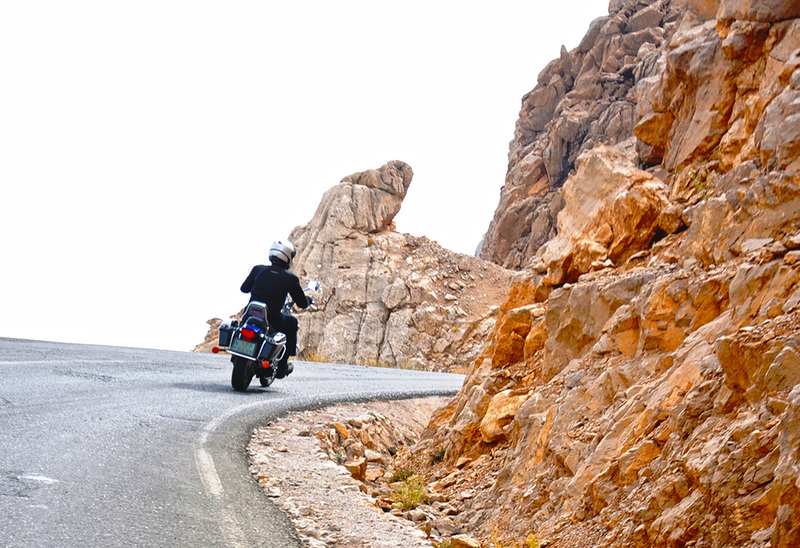 Leaving Yazd behind, find back your two-wheels to join Naein, some 170 kilometers away. Meanwhile, make a detour to the nested village of Chak Chak, the most sacred mountain and well-hidden shrine of Zoroastrianism with its beautiful fire temple. 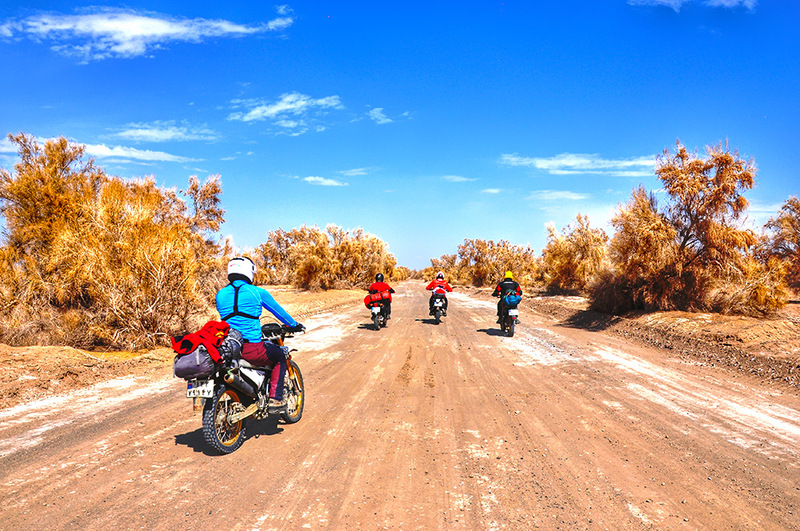 Riding between the Zagros Mountain and Dasht-e Kavir desert in this endless sea of dust, is an epic drive experience, after which you reach Isfahan, the marvelous blue city known as "half of the world". As for Yazd, we take a full day to visit the city. For once, allow yourself to get lost in the alleys of the bazaar, surrounded by the smell of spices, before being in awe in front of the beautiful blue-domed mosques of Naghsh-e Jahan square or alive bridges. After a night in this enchanting atmosphere, it’s time to hit the road again and explore the Karkas Mountains. We kick in the gears to access some remote mountain villages. As the Sun is going down, enjoy your arrival in Kashan, with the sunset coloring the sky in flaming red. Tehran is getting closer, but before reaching it, experience an incredible sandy day off the tarmac: drive into the spotless sand of Maranjab desert with the dunes as sole horizon. You may catch sight of a beautiful caravanserai hidden in the sand dunes, unless it’s a mirage! Explore the area to discover it…before setting the course on the vast silvery Namak salt lake. Spend an unforgettable night in desert before heading, on the next and last day, to the city of Mountains in front, Tehran. This tour is a one-way trip from Shiraz to Tehran. In Shiraz, you are welcomed by your guide the evening before the departure, to attend a briefing session and discuss the itinerary. On the first day, you can freely visit Shiraz, discover its bustling bazaar, its mystic Hafez and Saadi's tombs, and its blazing Holy Shrine of Shah Cheragh. 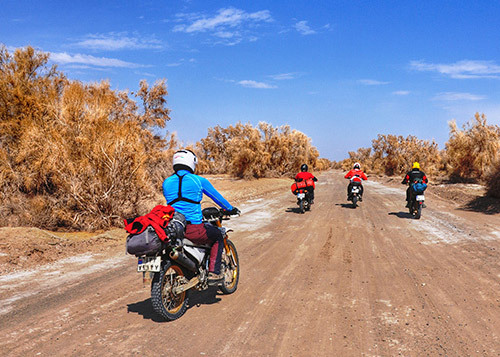 Start getting familiar with the bikes on the second day, for a ride toward the heavenly Eram Garden, and then around Bamou national park. On the third day, you leave Shiraz for the northeast, in order to visit the World Heritage Site of Persepolis and spend the night at Pasargadae. On day fourth, an incredible ride through the arid province of Yazd is waiting for you, before spending the night in the hometown of the oldest living tree, Zoroaster cypress in Abarkuh village. The next day, go deeper into the desert, to explore the ghost town of Dehshir, before reaching Yazd at sunset. In Yazd, you can spend a whole sixth day and night to enjoy the charming city of adobe, the 23rd heritage of Iran listed in UNESCO heritage list. Visit the graceful Jameh Mosque and its delicate mosaics and painted-tiles, before exploring the Qanat, an underground water canal accessible from the mosque. Don’t miss the Amir Chaghmag complex with its impressive three-storey façade, made of a series of perfect and symmetrical alcoves. On day seven, embark again to ChakChak, one of the most important Zoroastrian sites: Beautifully nested in the mountain, this sacred site offers a stunning view over the valley, and its fire temple, reached by climbing 230 steps, is one of the most beautiful. From there, head toward the city of Naein for the night. For the eighth day, follow an incredibly scenic road between the mountain and the desert to finally enter Isfahan. In this city, known as "Half of the world" for its many wonders, we appreciate a full day (ninth day) to visit its blue mosques, discover its bazaar and palaces. On the tenth day, you are back on the tarmac, to make your way through the Zagros Mountains and toward the lovely town of Kashan. For the eleventh day, experience a ride into the sand, in the Maranjab desert, one of the most beautiful deserts of Iran. There, you can explore an ancient caravanserai as well as a splendid salt lake. Finally, for the last day, hit the road toward your endpoint, Tehran, the capital city of Iran.